When speaking with clients about their options for web analytics, the common choice among them is to go with Google Analytics for tracking visits, page views and goals. It’s low price tag (free) is very attractive, but for me, the biggest selling points are integration with AdWords, advanced segmentation, and the ease of use of their tagging application, Google URL Builder. You may be wondering what my reference to URL tagging is all about, but don’t feel bad – you’re not alone. The majority of site owners I speak with don’t utilize any of the advanced features offered in this free analytics package, and rarely go past the first layer of metrics with visits and page views. I can go on and on about the benefits of knowing entry/exit pages, traffic sources, and keywords but that’s for another day. Achieving measurable results takes hard work, dedication and careful analysis of what works and what doesn’t work. With Google URL Builder you can append “tags” to track results of your interactive campaigns, whether you are promoting via email, social media or landing pages. Using just three variables, source, medium and name, you can easily segment your visitors and use the results in deciding where to allocate the most resources during your next campaign. As an example, I will use the tool to prepare links to our website from the next Johnson Direct eTips monthly newsletter (hint, hint- you should probably sign up). The goal is to track the amount of visitors to the home page that clicked through from the email. While most email marketing platforms will provide metrics on clicks and click-through rates, I like to go the extra step to make sure both the platform and Google works in harmony. You can go more in depth by incorporating Term and Content tags, but for simplicity I will just demonstrate the three required fields of Source, Medium and Name. 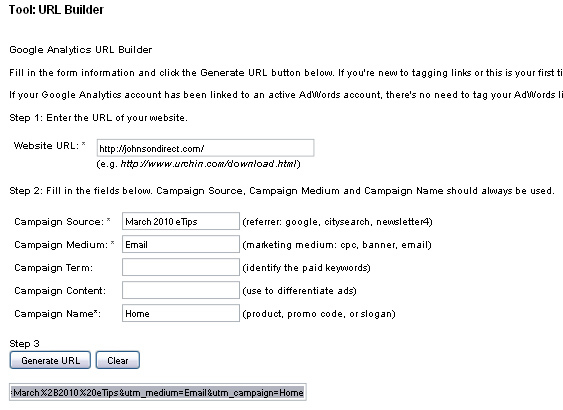 In the above example, the Campaign Source is the name of this month’s newsletter, “March 2010 eTips”. You should use this field to define the source for your link. If you are utilizing a Facebook fan page to build buzz or a community around your company, brand or product, then a good Campaign Source name would be “Facebook Fan Page”. The best part about web analytics is that there is not set way to do things. Use a system that works best for you, so it’s easily explained and repeated in future campaigns. Campaign Medium is the method in which you are distributing your content. In this example, I used “email”, but other good labels could be “Facebook”, “Landing Page”, “Banner Ad”, “Twitter”, etc. It really just depends on what you use to promote the link. Finally we have Campaign Name, or, keywords used to define the purpose of your content distribution. In my example I used “home” because that’s what I’m promoting – a link to the Johnson Direct homepage. In the past I’ve worked with clients that use brand, promotion or campaign names – again, it’s really up to you and how you want it showing up on your reports. Since Google Analytics takes about 24 hours to properly sync, the above results are from another campaign we ran with URL tagging. For more information or to use Google URL Builder, click here. Short and Sweet: Will URL Shorteners Go Mainstream in 2010?